Hinshaw, Stevens, age 22, born in Kansas; father born in North Carolina; mother born in Indiana; married within the year; farmer. 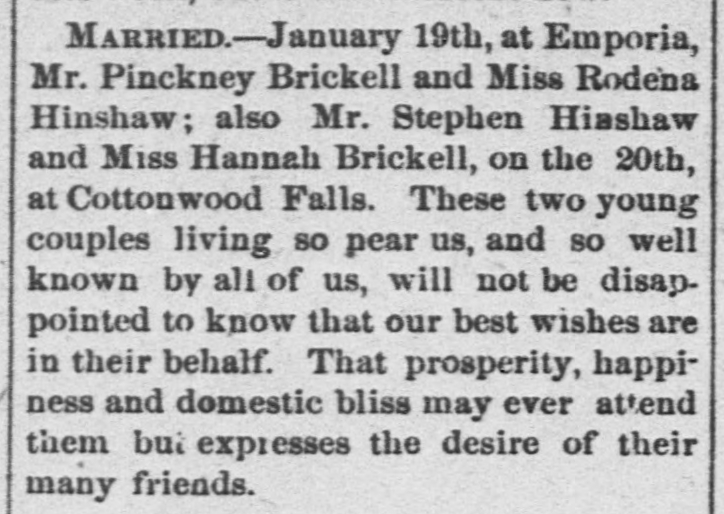 Hinshaw, Hannah H., wife, age 21, born in Tennessee; parents born in Tennessee; married within the year; keeping house. Henshaw, Steven, head-of-household, age 42, born Jan 1858 in Kansas; father born in North Carolina; mother born in Indiana; married 20 years; occupation: farmer; rented farm. Henshaw, Hannah, wife, age 41, born May 1859 in Tennessee; parents born in Tennessee; married 20 years; 9 children, 7 living. Henshaw, George, son, age 19, born Jan 1881 in Kansas; father born in Kansas; mother born in Tennessee; occupation: farmer. Henshaw, David, son, age 17, born Nov 1882 in Kansas; father born in Kansas; mother born in Tennessee; occupation: farmer. Henshaw, Ellen R., daughter, age 13, born Aug 1886 in Kansas; father born in Kansas; mother born in Tennessee; attended school 7 months. Henshaw, Francis, daughter, age 11, born Oct 1888 in Kansas; father born in Kansas; mother born in Tennessee; attended school 7 months. Henshaw, Danil, son, age 8, born May 1892 in Kansas; father born in Kansas; mother born in Tennessee. Henshaw, Steven Jr., son, age 5, born Nov 1894 in Kansas; father born in Kansas; mother born in Tennessee. Henshaw, Hannah, daughter, age 2, born May 1898 in Kansas; father born in Kansas; mother born in Tennessee. Hinshaw, Stephen C. Sr., head-of-household, age 52, born in Kansas; parents born in North Carolina; first marriage, married 30 years; occupation: inspector, pa[..unclear..]; rented home. Hinshaw, Hannah L., wife, age 50, born in Tennessee; parents born in Tennessee; first marriage, married 30 years. Hinshaw, George A., son, age 29, born in Kansas; father born in Kansas; mother born in Tennessee; occupation: salesman, wholesale clothing. Hinshaw, David S., son, age 27, born in Kansas; father born in Kansas; mother born in Tennessee; attended school. Hinshaw, Frances L., daughter, age 20, born in Kansas; father born in Kansas; mother born in Tennessee; attended school. Hinshaw, Daniel H., son, age 17, born in Kansas; father born in Kansas; mother born in Tennessee; attended school; occupation: steward, Elk's Club. Hinshaw, Stephen C. Jr., son, age 15, born in Kansas; father born in Kansas; mother born in Tennessee; attended school; occupation: news boy, street. Hinshaw, Sarah H., daughter, age 11, born in Kansas; father born in Kansas; mother born in Tennessee; attended school. Hinshaw, Albert F., son, age 8, born in Kansas; father born in Kansas; mother born in Tennessee; attended school; occupation: news boy, street. Hinshaw David S, student, b 824 Commercial. Hinshaw D Hainer, student, b 824 Commercial. Hinshaw Frances L, clk, b 824 Commercial. Hinshaw Ira (Julia Elma), b 820 Commercial. HINSHAW LATEN R (Grace M), Staple and Fancy Groceries 623 E 6th av, Tel 634, r 621 same. Hinshaw Stephen C (Hannar L), steward, r 824 Commercial. Hinshaw Stephen C Jr, student, b 824 Commercial. Hinshaw, Stephen C., head-of-household, age 61, born in Kansas; father born in North Carolina; mother born in Indiana; rented home; [occupation cut-off]. 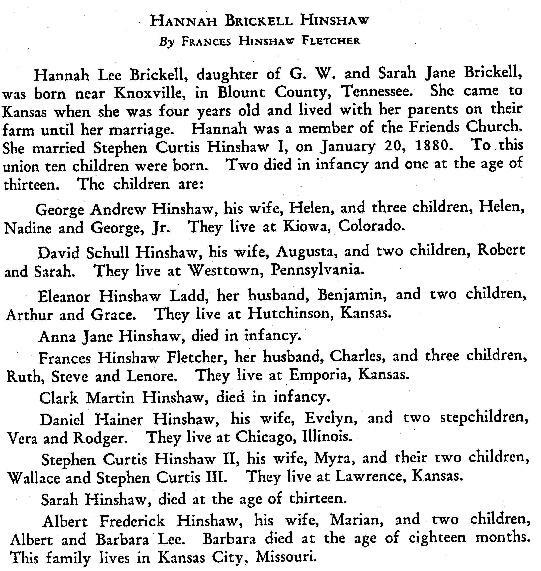 Hinshaw, Hannah, wife, age 60, born in Tennessee; parents born in Tennessee. Hinshaw, Albert, son, age 18, born in Kansas; father born in Kansas; mother born in Tennessee. Hinshaw, Steve, head-of-household, age 72, born in Kansas; father born in North Carolina; mother born in Indiana; first married at age 22; owned home ($5500 value); radio in home; occupation: none; not a veteran. Hinshaw, Hannah, wife, age 70, born in Tennessee; parents born in Tennessee; first married at age 20. Hinshaw, Albert, son, age 28, born in Kansas; father born in Kansas; mother born in Tennessee; single; occupation: coach, college; not a veteran. Daughter Frances wrote a biographical sketch of her mother and family, which was published in 1940 by The Chase County Historical Society20 (see below). 1900 census, Emporia Township, Lyon County, Kansas; roll T623-487, ED 73, page 13A, line #27, dwelling #267, family #267. 1910 census, Emporia, Lyon County, Kansas; roll T624-445, ED 51, page 190A, line #1, dwelling #226, family #238. 1920 census, Emporia, Lyon County, Kansas; roll T625-538, ED 55, page 10A, dwelling #240, family #260. 1930 census, 4th Ward, Emporia, Lyon County, Kansas; roll T626-709, ED 17, page 4A, line #8, dwelling #3, family #3. 1880 census, Emporia Township, Lyon County, Kansas; roll T9-0387, ED 110, page 296B, line #34, dwelling #164, family #167. 1870 census, Toledo P.O., Toledo Township, Chase County, Kansas; roll M593-430, page 24B, line #32, dwelling #43, family #44. 1900 census, Emporia Township, Lyon County, Kansas; roll T623-487, ED 73, page 13A, line #46, dwelling #271, family #271. 1930 census, 4th Ward, Emporia, Lyon County, Kansas; roll T626-709, ED 17, page 4A, line #2, dwelling #2, family #2. "Chase County Historical Sketches", Vol. I; The Chase County Historical Society, 1940; http://www.ancestry.com.